It’s been so cold in Bend! Last week, our daytime highs were in the 20’s and the night time lows were in the negative single digits. Not only were we blasted with winter temperatures, Mother Nature also granted us 6 inches of snow. The kids enjoyed the snow and weren’t phased by the arctic temperatures. 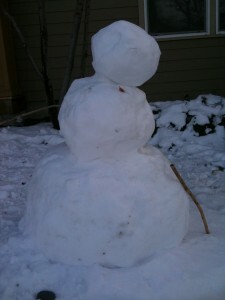 They made a really cute snowman with Carlos and loved pelting each other with snowballs. I’m not to sure how the Red Wigglers felt about this unseasonably cold weather. I’m going to check on them and the Sunchips bag today and will record all of my data for my ongoing experiment. It will be a quick visit because there is a nice layer of snow on the top of the worm bins, and I don’t want to expose them to the outside temperature for too long. That wouldn’t be too nice to blast them with cold air…yuck. Be back in a bit!